My relationship with my breast cancer team is a true testament to Sutter’s tagline, We Plus You. Last year after a routine mammogram, then a follow-up mammogram and ultrasound at Sutter Imaging, Sacramento, I was called in by my radiologist, Dennis McDonald, M.D. Dr. McDonald explained to me that there was a very small mass on my mammogram. It was frightening news, but I appreciated his delivery. And from there Dr. McDonald went out of his way and rearranged his schedule to do my biopsy so I didn’t have to wait to get all my pathology results. I received them the next day and I had Stage 1, ductal, invasive breast cancer. The day of my surgery he came in on his day off to do a wire procedure. He was wonderful. Dr. McDonald referred me to Elizabeth Kim, M.D., a surgical oncologist at Sutter Roseville Medical Center, to learn her treatment options. Sutter Roseville Breast Center is an American College of Surgeon, National Accreditation Program for Breast Centers (NAPBC), accredited breast center dedicated to providing compassionate, patient-centered and state of the art breast care. My fear of being diagnosed with breast cancer became all too real and I realized that there was no turning back. I was a little panicked at first, but I accepted the fact that I had breast cancer and I decided to be strong and get through this adventure with a positive attitude and determination. Before we saw Dr. Kim I talked to my husband, Gary about getting a double mastectomy to be on the safe side. He wanted me to do whatever I pleased. 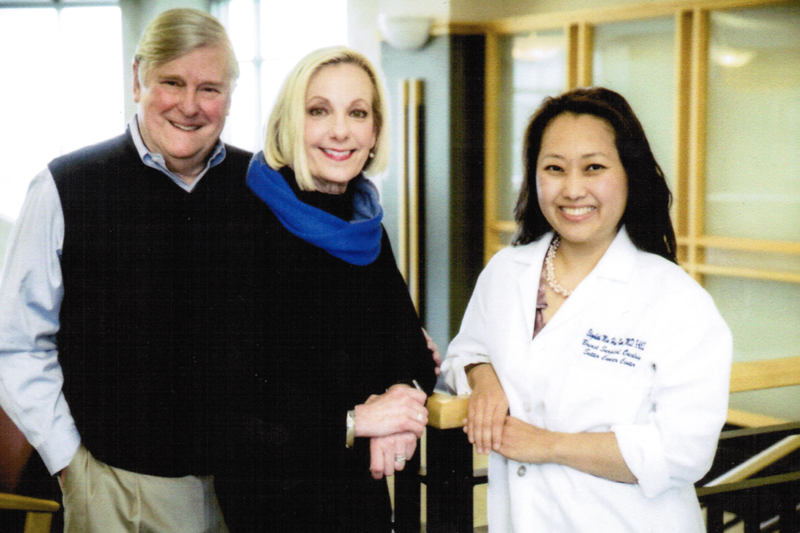 But when Dr. Kim took the time to educate and listen to Gary and me about my concerns and options, we all decided a lumpectomy with radiation would give me the same results and outcome as a more drastic surgery. 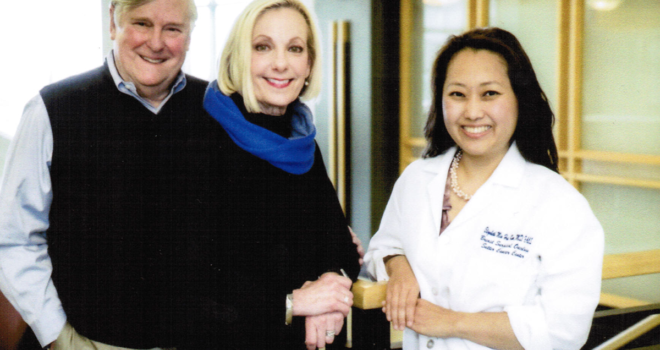 From that initial meeting I had such confidence in Dr. Kim, I knew she had the skills to treat my cancer and at the same time provide an aesthetically pleasing result. I trusted my husband would stand by my side through everything, as he always had, and that gave me a great deal of support and comfort. I was diagnosed in November of 2013 at age 64 (and 11 months) and had my surgery at Sutter Roseville in January 2014. After surgery, I remember Dr. Kim told me in recovery that my nodes were all clear. Her sincerity and compassion touched me. With a fellowship in Breast Surgical Oncology, Dr. Kim’s training and expertise in advanced surgical oncology techniques focus on targeting the tumor and providing optimal cosmetic results. With my surgery, Dr. Kim used a technique referred to as “oncoplastic” breast conservation surgery which combines oncologic principles with plastic surgical techniques. I was delighted with the results. You couldn’t even tell I had surgery. Not only were the results great, I felt great too. Prior to and during my treatment I also met with Amy Beazizo, breast cancer nurse navigator, Maude Blundell, genetic counselor, Kristie Bobolis, M.D., medical oncologist, and Janice Ryu, M.D., radiation oncologist. Everyone along the way was great. I truly feel a partnership with my team and Dr. Kim. It’s unusual to find a doctor that is so highly educated and skilled but has such compassion. I will never forget what she said at our post-surgical appointment, that she will follow me and be there for me in the long run. It was so reassuring. I completed my 16 days of radiation in March 2014 and got back to practicing yoga and looking forward to the next fishing trip with my husband, Gary. I have now dedicated myself to promoting Susan G. Komen and its mission. My message to fellow breast cancer survivors is that as a result of the organization’s efforts in raising research dollars, grants and providing education for advances in cancer, they have made it possible for women like us to have a positive outcome. I would hope that everyone would support Susan G. Komen’s continuing quest to find a cure before more women are diagnosed with breast cancer. Please read the book, “Promise Me”, by Nancy G. Brinker, the founder of Susan G. Komen for the Cure. You will love it!!! !